If your lower back has bothered you, you are not alone. Eight out of ten adults will experience low back problems at some time in their lives. Most symptoms of low back pain are blamed on poor muscle tone in the back, muscle tension, spasms, ligament or muscle tears, and joint problems. In the past individuals have subjected themselves to prolonged bed rest, uncomfortable traction, heavy sedation, injections, and surgery. But there is a safer, more natural approach to healing the back: Chiropractic care. Doctors of Chiropractic medicine (D.C.s) adjust the spine with easy, manual thrusts to move the spinal vertebrae back to their normal positions. A chiropractor will sometimes also adjust the joints of the neck, arms, and legs. Spinal adjustments may relieve a spectrum of ailments such as headaches, certain types of migraines, menstrual cramps, allergies, asthma, stomach disorders, spastic colon, and arm, hand, and leg pain that’s due to dysfunction of the neck or lower back. Some patients with asthma and emphysema turn to chiropractic care to release tension in the chest. Research is helping to determine if manipulation of the neck helps the ears drain properly, thus alleviating otitis media — the ear infection that plagues children. Chiropractic care emphasizes the body’s ability to heal itself without resorting to drugs or surgery. This is made possible because the functions of your entire body are controlled by the brain, spinal cord, and all of the nerves that make up your nervous system. When your nervous system is impaired, it can cause malfunction of the tissues and organs throughout your body. Chiropractic care is unique in that it offers you a mechanical solution to a mechanical problem. A chiropractor seeks to locate the offending spinal structures and reduce their impact on your nervous system, essentially restoring your body to health without the use of drugs or surgery. Though chiropractic is unique, it isn’t new. Chiropractic care has helped millions of people since 1895. What Happens during a Chiropractic Examination? A chiropractor will take a medical history, conduct physical, neurological, and orthopedic examinations. Chiropractic physicians spend a considerable amount of time assessing posture, examining the spine, testing reflexes, joint motion, and muscle strength. X-rays and other diagnostic images are often used to locate vertebral dysfunction and to rule out disorders like tumors or fractures, which require the attention of other healthcare experts. The term adjustment is used to describe any of the many ways that the 24 moving vertebrae in your spine can be restored to a more normal position and motion. At Blackstone Chiropractic, we use a newer type of adjusting technique known as the Activator Method. This method has become the most widely practiced “low force” technique in chiropractic. There is no “cracking” or “popping” of the vertebrae. Rather, the hand held Activator instrument delivers a very quick and directed thrust to a specific vertebrae with improved safety and comfort. The thrust delivered by the instrument is so quick that it accelerates ahead of the body’s own tendency to tighten up and resist the thrust of a conventional adjustment. Because of the accuracy and controlled light force, Activator Method adjustments are suitable and comfortable for all types of patients, ranging from pregnant women and children, to athletes and senior citizens. The Activator can only be used by a specially trained Doctor of Chiropractic. Each year, Dr. Olff completes continuing education courses specific to the Activator Methods. 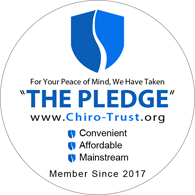 A Doctor of Chiropractic is concerned with preserving and restoring health, and focuses particular attention on the condition known as vertebral subluxation. The term vertebral subluxation complex is used to describe what happens when spinal bones lose their normal position and range of motion due to stress, trauma or chemical imbalances. A subluxation is evaluated, diagnosed, and managed through the use of chiropractic procedures, by the Doctor of Chiropractic. Blackstone Chiropractic also employs the use of physiotherapy to complement adjustments. Over and over again, Blackstone Chiropractic has seen firsthand the benefits of physiotherapy used in combination with proper chiropractic treatment. One key benefit is the way it helps patients regain movement and the ability to build strength, which is key to preventing reinjury. Just as with chiropractic treatment, Blackstone Chiropractic customizes each patient’s physiotherapy program depending on the type of injury and the individual’s health history.